We stand in the midst of ecstatic Phase Indicator Manufacturers and exporters, based in India. 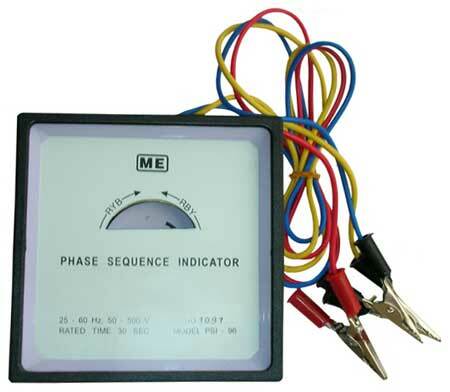 Our Phase Sequence Indicator is a portable and sturdy instrument having a rotating disc to indicate the sequence of the phases of 3 phase power supply. Clockwise rotation of the rotating disk of the PSI indicates proper sequence. Anti clock wise rotation indicates improper sequence. Electronic Phase Sequence Indicator provided by us is useful for checking the sequence of phases when the same are to be connected in proper sequence watt meters, power factor meters, motor and similar applications. 1-meter long red, yellow and blue test leads. 96 x 96 x 60mm, portable in ABS Body.